Please help keep our CSA running smoothly! If you have not yet fulfilled both your volunteer shift responsibilities, please sign up today. We need a volunteer to help unload the truck (2:30-3:30pm) on 10/27 so if you have not yet signed up, or if you are one of our amazing super Good Samaritan members, please sign up. CSA HARVEST FESTIVAL 2015 – PRIVATE EVENT! Leeks – These are so versatile. Use them in place of onions in soups. Here’s how to prep them: http://www.thekitchn.com/how-to-wash-and-prep-leeks-cooking-lessons-from-the-kitchen-183852. Radicchio – A lovely leaf chicory. It’s bitter, so I recommend pairing it with some hard cheese. Our favorite salad is radicchio sliced in thin strips with shaved Parmesan, olive oil, balsamic vinegar, fresh minced garlic and some homemade croutons. This week’s recipe for radicchio risotto is also delicious – cooking the radicchio mellows out the bitter flavor. Carrots – We love these beauties every which way! Russet Potatoes – A great variety for baked potatoes. They are flaky, not dense when cooked. They also make light mashed potatoes. Toscano Kale – This kale is best cooked since it has a very sturdy leaf. Think soups & stews. Or try this week’s recipe paired with lentils & pasta. Farmer’s Choice – We’re rotating through a few different crops that are coming in at different times. We do everything possible to make sure that all members receive the same items over the course of a few weeks. If you don’t get an item this week, you can look forward to receiving it in future weeks. Please remember to only take fruit if you have already registered, paid and it says “FRUIT” next to your name on the check-in sheet. Please note: THE FRUIT SHARE IS NOT ORGANIC. PLEASE BE SURE TO WASH THE FRUIT BEFORE YOU EAT IT. 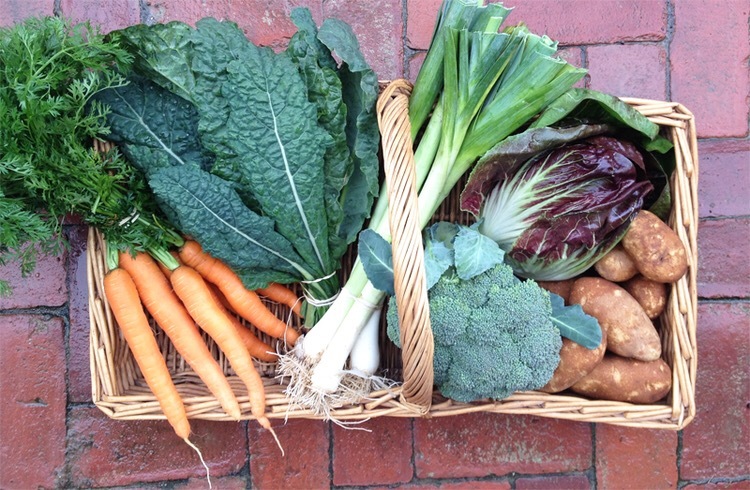 Delivery from The Lewis Waite Farm is today.